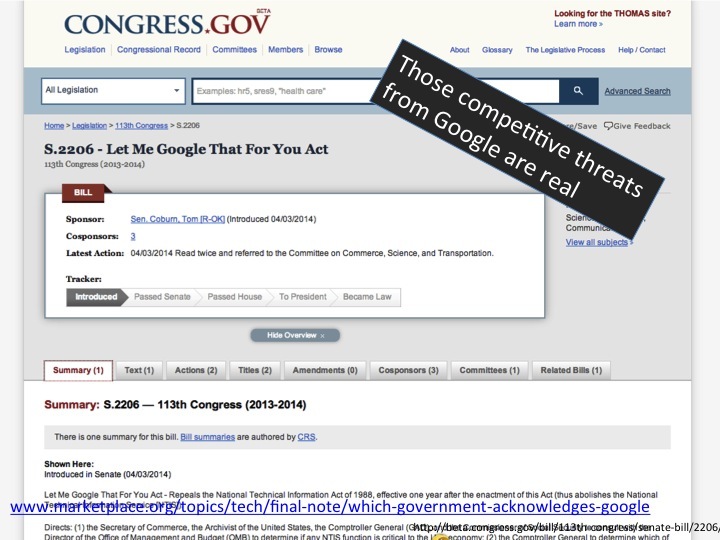 “This Act may be cited as the “Let Me Google That For You Act”” is meant to “streamline the collection and distribution of government information.” (https://beta.congress.gov/bill/113th-congress/senate-bill/2206/text). “In which the government acknowledges Google” as Kai Ryssdal puts it in an episode of Marketplace from APM (a favorite podcast of mine) a few months ago. (A) “Of the reports added to NTIS’s repository during fiscal years 1990 through 2011, GAO estimates that approximately 74 percent were readily available from other public sources.”. (B) “These reports were often available either from the issuing organization’s website, the Federal Internet portal (http://www.USA.gov) or from another source located through a web search.”. (C) “The source that most often had the report [GAO] was searching for was another website located through http://www.Google.com.&#8221;. (D) “95 percent of the reports available from sources other than NTIS were available free of charge.”. It is not just libraries that feel, and respond to, those competitive threats from Google.